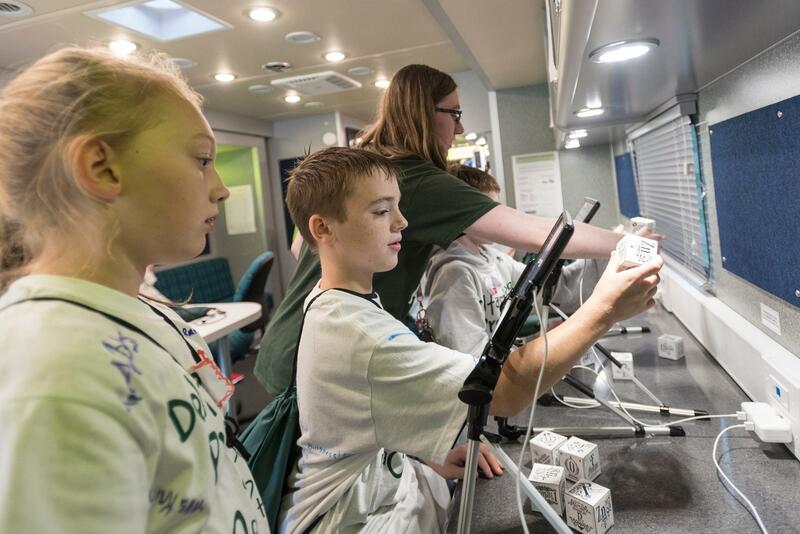 It's a 38 foot mobile science laboratory – and creative space – complete with the latest technologies. Thanks to a $4 million grant from the Herbert H. and Grace A. Dow Foundation, Delta College developed this program to reach out to middle and high school students in the Great Lakes Bay Region to provide information about the vast opportunities available in science, technology, engineering and math. 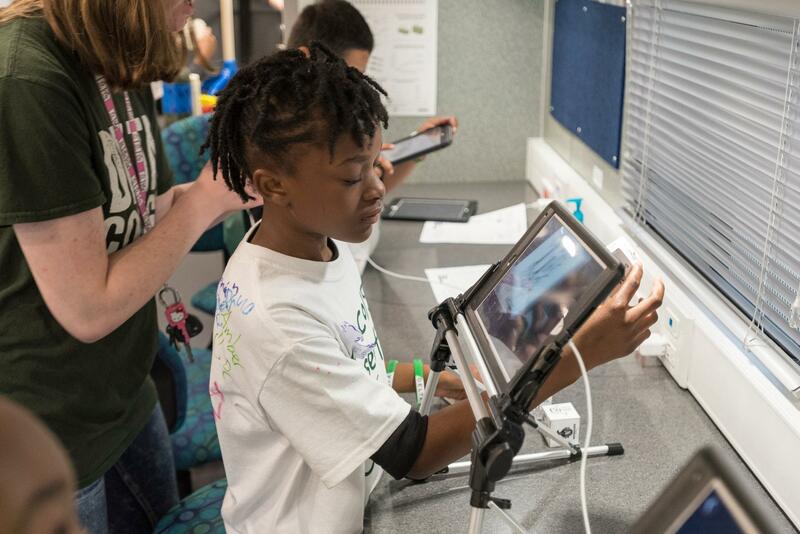 Through this Program, students become engaged and enthusiastic about STEM topics. What makes the Explorer cool? Scheduling requests for the 2018-19 school year visits (for both middle school and high school) are underway as well as community events. Please submit the appropriate form below as soon as possible. Dates are filling quickly. For community event visits, complete the STEM Explorer community event request form. For middle school visits, complete the STEM Explorer Surface Exploration form. 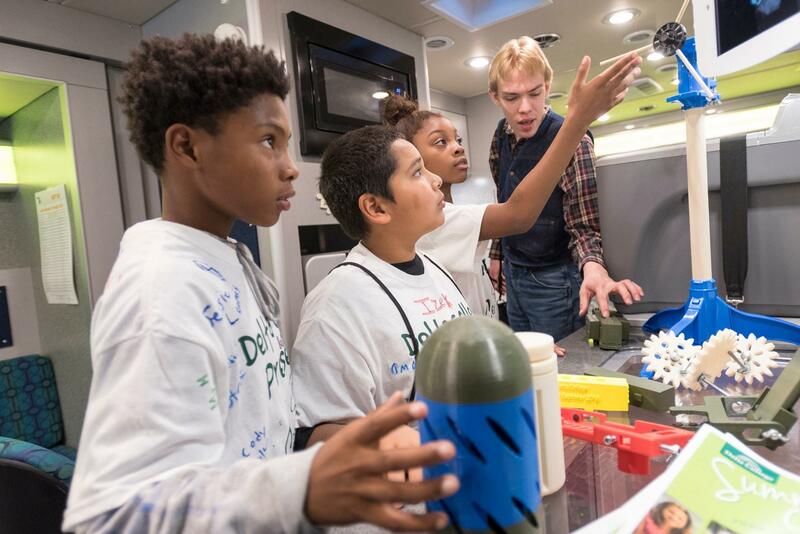 For high school visits, complete the STEM Explorer Deep Dive form. 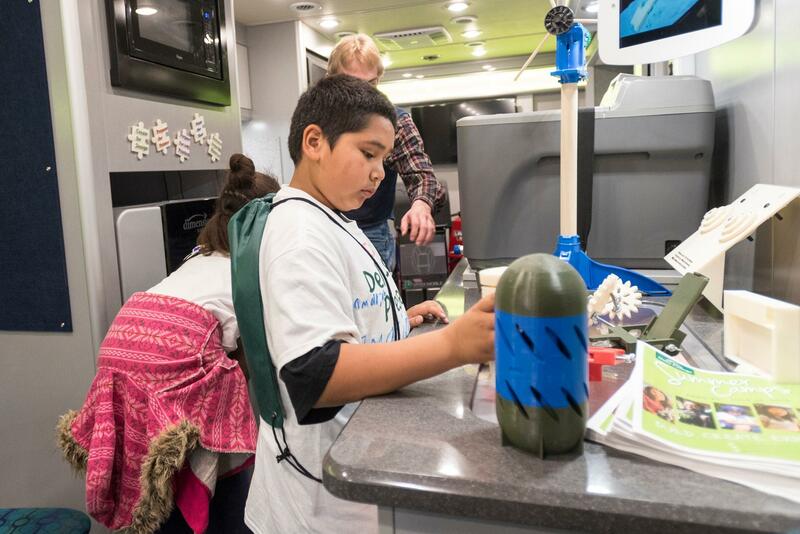 Exciting and educational activities are conducted on the STEM Explorer vehicle for scheduled middle school and high school sessions. 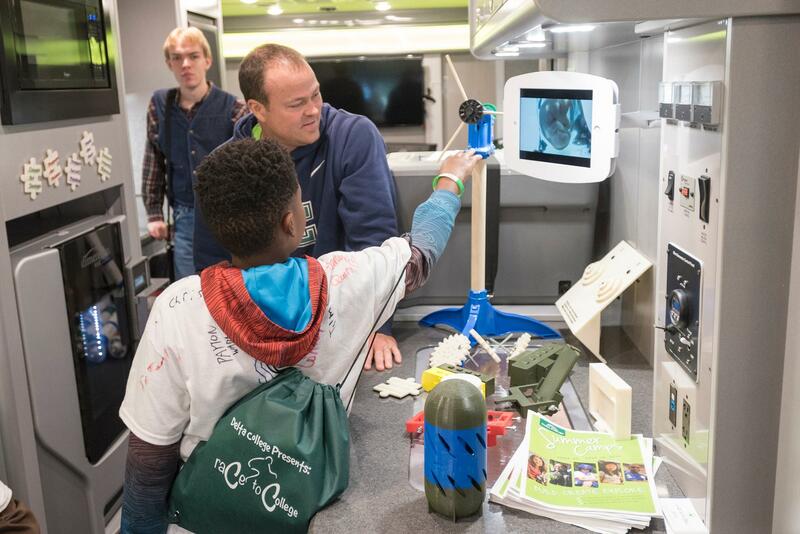 In addition, you can expect to see the STEM Explorer at different Great Lakes Bay Region events throughout the year. 3D Printing: Visitors to the STEM Explorer experience first hand the creation of 3D printed parts on our state-of-the-art Stratasys Dimension printer. Augmented Reality: Students step into the awe-inspiring realm of augmented reality by simply using an iPad and its camera. Elements 4D by Daqri is a great introduction to elements and simple. Choking Charlie: Students learn how to dislodge an object impairing the airway of another person. Delta Crime Busters: Students examine microscopic forensic evidence to solve a fictitious crime. Who broke into the Delta biology lab and broke the microscope? Delta Crime Busters II: The Case of the Missing Exam: Students examine microscopic evidence from a crime scene to find out which student broke in to the Delta College classroom and stole the coveted final exam a week before the test. Electrical Conductivity of Solutions: Students put on their chemist hats to test conductivity of various chemical solutions. Google Artificial Intelligence: Students are introduced to and use the Google Vision and Google Voice Artificial Intelligence devices. Human-Human Neurotransfer: Students are introduced to the exciting world of neuroscience. Students have the opportunity to literally take control of another person’s hand using nothing but their minds, an Arduino, and a TENS unit. Intro to CPR: Students are provided with a 20 minute CPR crash course as a preview to the required Michigan CPR training. 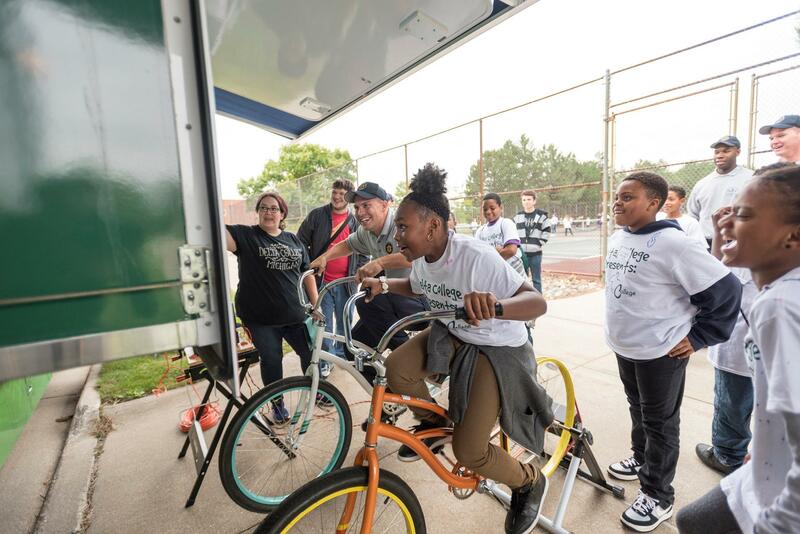 Power through Pedaling: Students race against time and each other to generate the most wattage and burn the most calories on our STEM Explorer Super Bikes! Projectile Motion: Student teams use knowledge of projectile motion to compete to hit various targets using foam balls and air canons. Snap Circuits: Students learn the basic ideas of electrical circuitry in a safe and educational manner. Software Emulation: Students learn the basics of software emulation of a Playstation console with the use of a raspberry pi. Video Game Design: Students use the Bloxels game building platform to create, modify and play their own video game creations. Virtual Reality: Our virtual reality goggles take students on a virtual tour of our known universe without leaving the confines of the STEM Explorer! The virtual tours include: the Chernobyl disaster, a safari, an astronaut and prehistoric wildlife. Welding Simulators: Students again get to experience virtual reality – this time on a job site. The Lincoln Electric welding simulators are a great introduction to a possible STEM career. The STEM Explorer Deep Dive program is a discipline-specific design/engineering challenge for grades 9-12. The challenge for prior academic years involved building a cell phone case with a secondary purpose. Physics students built an enclosure to protect a cell phone in a collision. Chemistry built a case that is waterproof and buoyant in water. Biology built a case that attaches to a microscope to study and record microscopic organisms. And, Geoscience built a device to turn a cell phone into a modern day Brunton Compass. For 2018-19 the two projects available are for physics and biology. Development is currently underway for Deep Dive projects in math, forensic science and building trades with an expectation of implementation during the 2019-20 school year. 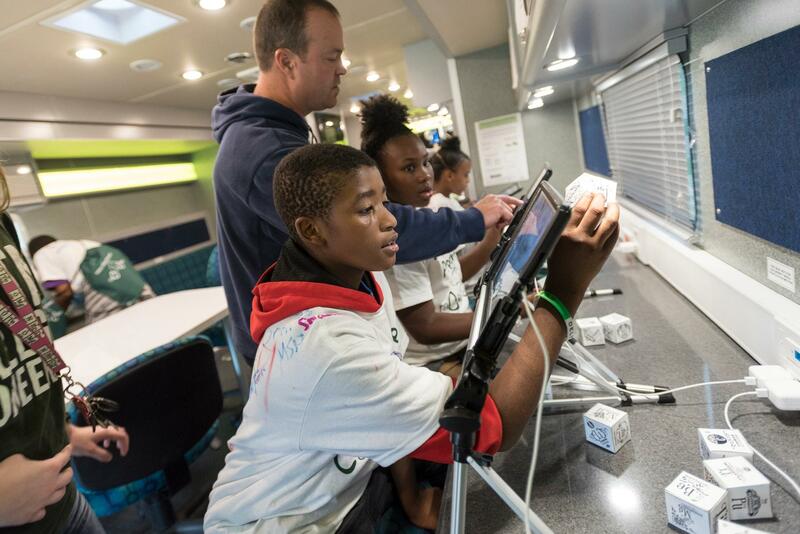 Students use SolidWorks software, an industry standard in rapid prototyping, to design and print their creations on the STEM Explorer’s state-of-the-art Stratasys 3D printers. 40% of local economy is driven by STEM industries. 2/3 of Delta's programs are STEM related. Estimated to reach 7,000 local students each year.